Just off the phone to Carsten Franik at Mega Marine who says he's been apponted central agent for sale of Icon's 42m motor yacht Basmalina II, now on the market for the first time since her launch in mid 2011. She sports a stylish and contemporary interior offering up to 12 guests sumptuous accommodation in four staterooms including a master suite, VIP stateroom, double and twin cabin. In addition, the skylounge can be used for entertainment or as a further en suite guest cabin. Basmalina II boasts the latest sound and AV entertainment systems and, courtesy of two 2000 bhp MTU engines, she comfortably reaches top speeds of up to 18 knots. 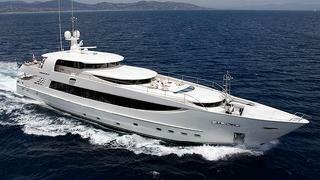 Lying in the South of France, Basmalina II is asking €18.5 million.